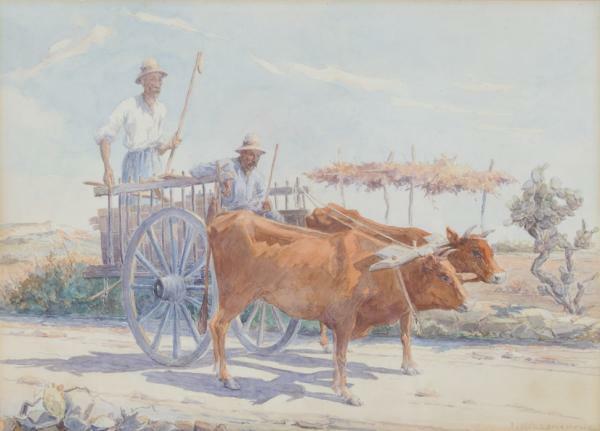 Farmers in an ox drawn cart is a genre piece inspired the plein air tradition. It depicts a typical scene from the life of farmers in the first half of the 20th century, when they still using the same traditions and methods that their ancestors had used for centuries.The artist renders the scene in a realistic manner, and we can see his interest in and focus on detail. The skilled draftsmanship of the piece holds the same significance as the choice and use of colour. With calm brushstrokes, the artist constructs the piece with the harmonious contrast of cold and warm colours and the delicate relationship of light and dark. The low horizon allows the work to open upwards and the horizontal arrangement of subjects creates a feeling of a peace and tranquility.